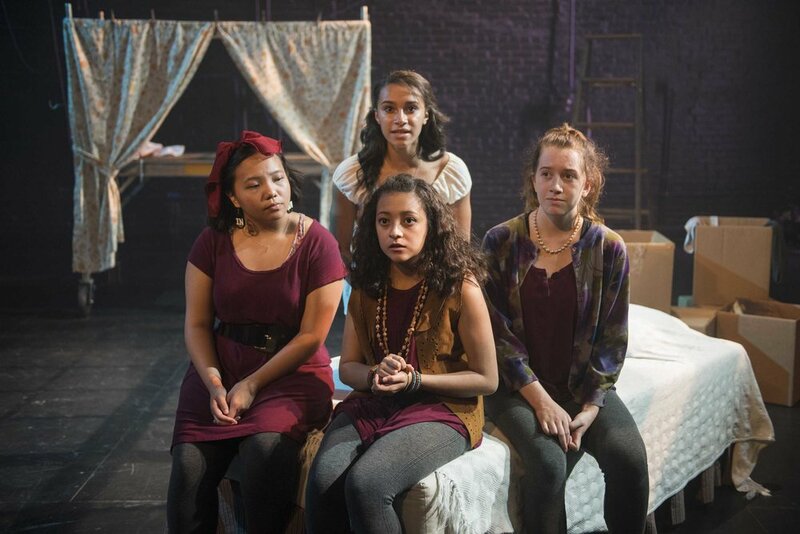 \The Milwaukee Rep’s current production of Lost Girl focuses on a young woman struggling to grow up. As she evolves from a little girl, enchanted by magical stories, to a young woman asking hard questions about her future and the people around her, she loses her innocence, but finds confidence in her true self. The show is beautifully rendered by a group of teens who can identify with the protagonist both personally and professionally. They are all part of the Milwaukee Rep’s Professional Training Institute (PTI) — a program designed specifically for young people to find their voices and begin their careers in the professional world of the performing arts. Now in its second year, the advanced actor training program for high school students attracted more than 100 auditioners. But for this season’s cohort of PTI students, only 16 were chosen —from 14 different schools. Over the course of the year, the budding actors met once a month to attend workshops with notable theater professionals with connections to the Rep. Guest mentors included Nicholas Rodriguez (Guys and Dolls), Soraya Broukhim (The Who & The What), Milwaukee Rep casting director Frank Honts, Milwaukee High School of the Arts graduate and creator of Murder for Two Joe Kinosian, Associate Artistic Director May Adrales, One House Over playwright Catherine Treieschmann, music mogul Abdul Hamid Royal (Black Pearl Sings! ), local favorites Mark Corkins, and Elizabeth Ledo, and Rep Associate Artists James Pickering and Angela Iannone. Nicolet High School junior Reese Parish really appreciated the opportunity to interact with these guest artists, especially local actor Norman Moses. “He talked about the business of acting,” she explained. “The financial life of an artist is just as important as getting up on stage and performing, and yet it’s the part of acting I knew the least about. It definitely gave me a new perspective on how I need to go about handling my financial life as I begin to become more of an independent actor and person,” she said. The program culminated in the world premiere production of Lost Girl, by Kimberly Belflower. This lyrical, ensemble play picks up the Peter Pan story long after Wendy has returned from Neverland. She brought a couple of the lost boys with her, but left her heart — and her kiss — behind with Peter. Although the magical orphan promised to come back for Wendy, she fears he has abandoned her. Now she must figure out how to move on with her life — and really grow up. Milwaukee Repertory Theater’s Professional Training Institute Ensemble presents the World Premiere of Lost Girl by Kimberly Belflower in the Stiemke Studio from July 19 to July 22, 2018. Left to Right: Mainyia Xiong, Juliana Garcia-Malacara, Reese Parish and Maricella Kessenich. Photo by Michael Brosilow. Portraying Wendy, Parish was deeply challenged by the part. “I had the most amazing time discovering who this brave young woman was and how she came to be the way she was. Through the play you see Wendy take the once shared narrative and make it her own.” She continued, “It’s a fantastic thing to witness young women being the focal point of theater. Working with the other strong cast members has elevated this production and helps us all feel connected to Wendy,” she said.